Gilbert Deflo's production of Monteverdi's L'Orfeo debuted at the Liceu in Barcelona in 2002 with Jordi Savall conducting La Capella Reial de Catalunya and Le Concert des Nations. It has appeared on disc before but is now re-issued in handsome CD form on the AliaVox label with an extended book full of photographs of the production. 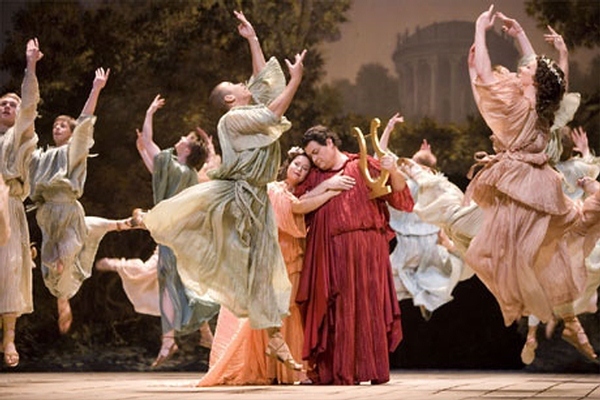 The cast includes Montserrat Figueras as La Musica, Furio Zanasi as Orfeo, Arianna Savall as Euridice, Sara Mingardo as La Messagiera, Cecile van de Sant as Speranza, Antonio Abete as Caronte, Adriana Fernandez as Proserpina, Daniele Carnovich as Plutone and Fulvio Bettini as Apollo. Judging from the photographs, the production was intended as a modern re-creation of 17th century style but in a theatre the size of the Liceu, inevitably the forces involved have to be somewhat larger than might have been the case in the original. Savall uses an orchestra of 24 (including 12 strings), and a 12 member continuo group (with most performers doubling on instruments), and a choir of 20. Similarly Savall's speeds are generally on the more relaxed side, though whether this is his preference or simply because of the size of the venue, I am uncertain. The opening Toccata goes with a nice swing and appealingly crisp. Montserrat Figueras's La Musica is poised and expressive with a lovely sense of the words, and that certain tang to the tone in her voice. Alas, Figueras does not reappear in another role. Furio Zanassi as Orfeo manages to convey that he has all the time in the world to put over the words, but yet makes it highly vivid. He has a rich, light baritone voice with a hint of edge to it. His account of Possente spirto is rather thoughtful, but with the ornamentation finely woven into the grain of his voice. His final scenes are nicely virile, almost heroic at times with the hints of strain at the top. The final duet with Fulvio Bettini's Apollo brings things to a fine conclusion. There are occasional little imperfections which show that it really was live. Usually, I have confess that I prefer tenors singing the role but grew to enjoy Zanassi's artistry. As Euridice, Arianna Savall sings with slim, fine-grained tone. La Messagiera, sung by Sara Mingardo, is characterfully expressive with a plangently vibrant tone. Cecile van Sant's Speranza is quite stately and perhaps a bit plummy of tone, but also passionate where necessary. Antonio Abete is wonderfully regal as Caronte, with superb projection of the words though I did wonder whether he tone was darkly black enough. Adriana Fernandez's Proserpina, with an interesting spice to her tone, is nicely vibrant, whilst Daniele Carnovich's Plutone has quiet a soft-grained baritone but with firm expressive tone. The Pastores are all nicely characterful whilst Marilia Vargas makes a plangent Ninfa. The chorus perhaps makes a more substantial sound than we might expect, but Savall ensures that their performances are nimble. And the dances in the first half are all taken with an infectious perkiness, whilst throughout the level orchestral and solo instrumental contributions is very high. The discs come in an incredibly thick book which contains articles by Jordi Savall, John Whenham, Montserrat Camps and Paolo Fabbri (in French, English, Spanish, Catalan, German and Italian) along with copious pictures of the original production. Overall, you suspect that this is very much Jordi Savall's show and that the sound-world reflects his own tastes. For all the drama, there are lovely moments and also some rather too stately ones. 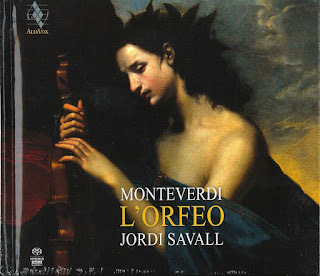 This is not my ideal L'Orfeo, but the production standards are very high and Savall's sense of having all the time in the world is very appealing.